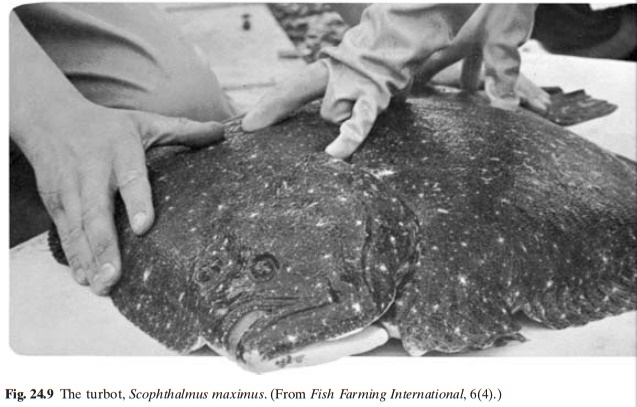 Among the flatfishes, the turbot Scophthalmusmaximus (family Scophthalmidae) (fig. 24.9)has so far proved to be the one with the greatest immediate aquaculture potential. Among the flatfishes, the turbot Scophthalmusmaximus (family Scophthalmidae) (fig. 24.9)has so far proved to be the one with the greatest immediate aquaculture potential. As a result of several years of research, especially in the United Kingdom and France, the main elements of a culture technology have emerged and pilot-scale production in these countries, and in Spain, has been initiated in recent years. Turbot is a highly priced marine fish for which there is a good demand, especially in Northern European markets. Natural production is reported to be insufficient to meet the demand. The species is known to be hardy and, though carnivorous in nature, can be fed on various feedstuffs and prepared feeds. Growth rates are fast and, at a water temperature of about 18°C, 5 cm juveniles reach a marketable size of 300–400 g in one year, and over 1000 g in about 18 months. The maximum recorded length of the species is 100 cm, but fish of about 50 cm are more common in the markets. Though early attempts at turbot culture were handicapped by inadequate supplies of seed stock, it is now possible to mass-produce fry in hatcheries. As culture has to be based on complete artificial feeding, intensive systems of culture are adopted mainly in tanks and cages. Cooling water from power stations has been used to maintain optimum temperatures and obtain accelerated growth rates. Two- to three-year-old female turbot (of 2 kg weight) have been observed to reach sexual maturity and spawn in the wild from May to August. Males reach maturity in the second year (1 kg body weight). The annual fecundity is about a million eggs per kg body weight. The diameter of the eggs varies from 0.9 to 1.2 mm. Mature fish will spawn naturally in tanks. Circular indoor tanks up to 2.7 m3 in size, supplied with warm water and continuous high-intensity illumination (up to 3000 lux), have been successfully used for spawning and larval rearing. The size and colour of the tanks do not seem to have any significant effect. Eggs and milt have also been obtained by manual stripping and artificial fertilization has been achieved. Through proper management of brood stock, it is now possible to produce eggs all year round. Temperature is maintained between 10 and 15°C, and the photoperiod is adjusted to obtain spawning at any time of the year. The eggs are incubated at about 12°C in filtered sea water treated with antibiotics. Newly hatched larvae are reared at densities of 30–45 larvae per , in 60–450 tanks. Temperatures between 18 and 20°C are maintained with 90 per cent water exchange every day. (Howell, 1979). When fed on Isochrysis galbana rather than Dunaliella tertiolecta, the larvae grew better and mortality was lowered. From the first day of hatching to about the eighth day, Brachionus is the preferred food; Artemia nauplii are then added and the rotifer reduced, usually terminating by about the eleventh day. Naupliar feeding is continued until the larvae develop into metamorphosed juveniles at a size of 25–30 mm in about 30–40 days. From about the eighteenth day, larger metanauplii of Artemia are used. The juveniles, weighing 55–105 mg, are weaned to artificial diets in less than two weeks. Dry pellet crumbs (400 mm size) give satisfactory results, but greater success has been achieved by the use of moist pellets, when survival rates have been increased to about 50 per cent. Experimental work (Person-Le Ruyet etal., 1983) seems to show that expanded pelletsenriched with inosine (a chemical attractant) increase food intake during the beginning of the weaning period, but the economics have yet to be determined. After weaning, dry pellets are normally used for feeding, and in about three months after hatching the fry attain a weight of around 2 g.
In areas where the temperature is much below the optimum range of 18–20°C, the fry are initially reared indoors, in heated water, and then transferred outside. If they are to be transferred during the summer months, they are grown indoors up to a weight of 5 g, but if they are to be transferred during winter, they are grown to at least 20 g size. Survival below 5–6°C is very low. In well-oxygenated water they can tolerate temperatures between 25 and 30°C, and salinities ranging from brackish to 40 ppt. For rearing up to 20 g size, dry pellet feed is commonly used, but for growth beyond that moist pellets (containing 25 per cent trash fish, as well as fish and meat meal, wheat middlings, brewer’s yeast, cod liver oil and a vitamin premix) are recommended. Moist pellets made from a mixture of industrial fish and dry compound meal have been used to feed 5 g fish at the rate of 2.6 per cent of body weight at 10°C and at 4.5 per cent at 15°C (Jones, 1981). Juveniles of 50 g weight are fed at 1.1 per cent of body weight at 10°C and at 2 per cent of body weight at 15°C. Dry pellets are not easily accepted by larger fish, but trash fish forms an excellent feed. After a period of one year’s growth under favourable conditions, turbot attain weights of 175–350 g in indoor tanks in areas with higher water temperatures, while a weight of about 120 g only may be reached in outdoor tanks. be 15 to 19°C. Though heated water may have to be used in growing tanks, the quantity of water required is not large as turbot are reported to require tanks with a surface area only equivalent to their own.